18" Doll Mermaid Tail Sack/Blanket Only $6.99! Down From Up To $18.99! You are here: Home / Great Deals / 18″ Doll Mermaid Tail Sack/Blanket Only $6.99! Down From Up To $18.99! 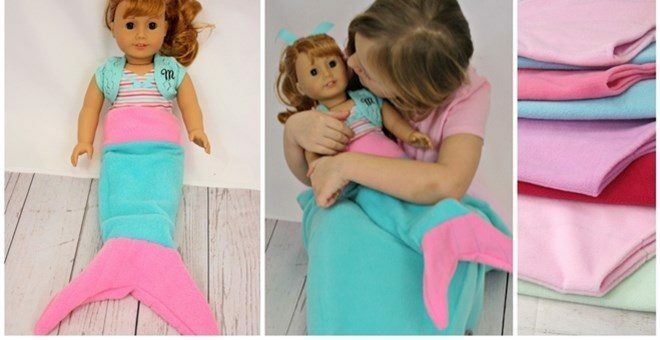 18″ Doll Mermaid Tail Sack/Blanket Only $6.99! Down From Up To $18.99! Jane has this 18″ Doll Mermaid Tail Sack/Blanket on sale for $6.99 (Reg. $18.99) through 4/16! Plus shipping is $2.99 for the first item and $1.00 for each additional item! Fun mermaid sack blankets for 18″ Dolls. The blankets are top stitched at the tail and add extra detailing. Made in USA from cuddly anti pill polar fleece.